When I was in NYC a few weeks ago I visited Hold Everything(looking for a magazine rack) and while I was there I saw something kind of cool, the Adler Advent Calendar. It’s a green lacquered box with a little door for each day of the season that spins around and reveals an illustration of a partridge. Behind the door is enough space to put a piece of candy or some other treat. If you got sick of the partridges you could even cut out pictures of different holiday things with your child and tape them to the inside of the doors. 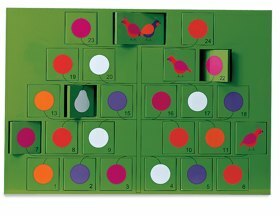 It looks beautiful and modern but at the time I wasn’t prepared to drop $148 on an Advent calendar, even if it is something we would enjoy for many years. I’m guessing I’m not the only one, because now it’s on sale for $99.99.